Wine making history and tradition. Wine making in the Cyclades islands goes back thousands of years to the 3rd millenium B.C. to Santorini, one of Greece's most beautiful islands. Nested in the heart of the Aegean, the island of Santorini is legendary in its wild and unreserved beauty that the Argonauts named Kallisti (the most beautiful). 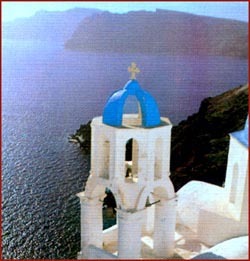 As myth holds, Santorini was made of a fistful of dust that fell on the sea. Today, the island is much loved for its lively Greek soul, particular colour, renowned treasures and unique vineyards that produce some of Greece's most famous wines. The 3,500 year tradition in vineyard cultivation and the art of wine production is maintained nowadays by the 850 growers of the Viticultural Co-operative who toil intensively the island' s 6,276 acres of vineyards (which represents about 1/3 of Santorini). What makes the island of Santorini so unique is the special ecological system, created by the continuous explosions of the local volcano and its lava, whose diffusion has burned the rocks and made the land absorbing, porous and rich in porcelain. The topology based on the steps technique when the aptitude is high preserves the soil for agricultural exploitation, while at the same time reduces the water losses. The secret of successful grape cultivation on the island, lies in the trapped humidity as well as the morning dew produced by the evaporation of the sea in the site of Caldera. The particular microclimate created by these two phenomena, relieves the thirsty vines during the long, hot months. On this dry and waterless land and under the intense heat and summer sunshine, flourishes one of the most aromatic varieties of winemaking grapes in the Mediterranean; the Assyrtico and the Aidani, Athiri and the red Mandilaria as well. -The Santorini's most famous wines are considered to be the white dry and aromatic wines Nykteri and Assyrtico and the world famous Vinsanto. Both the Nykteri and Vinsanto belong to the category of "Name of Origin of Superior Quality" and come under the European Union status for "Quality Wines Produced in Statedly Areas". -Nykteri took its name due to the fact that it is produced instantly in the middle of the night for the grapes, which were harvested just the day before. The viticulturists press the grapes from the morning till the night and the whole process of wine making takes place during the night when the temperatures are lower. The undermined "canavas" with their carefully studied windows create the adequate night streams, necessary for the fermentation process. -Vinsanto is a sweet, white or red wine produced from grapes dried in the sun. The celebrated sweet wine which expresses Santorini's uniqueness, it used to complete the gustative feasts of the Medieval times noblemen, while at the same time, comprised for centuries the "Holly Communion" to all the chalices of the Russian Orthodox Church. -Santorini's ecological conditions have produced over time a unique type of vine prunning that growers call "kouloura" (curl), because its shape resembles, a round basket. The "basket" shaped vines protect the soft and tender grape leaves from being damaged by the island's strong wind and thin sand. -Other products of special characteristics cultivated on Santorini's unique ecosystem except the grapes, the cherry tomato, the capers and the fava, are some vegetables cultivated in the island's crofts, such as the "katsounia" (a local cucumber variety), the white eggplant, the white watermelon, the fresh peas, the fresh beans and the potatoes. In addition, the barleycorn is cultivated on the island for a long time since our days, mainly for its use as forage and even for the making of crackers as well ("kritahrokouloures"-barley curls). Since the 50's on the island are cultivated pistachio-trees. The pistachio fruit is smaller than the usual and its taste has a sweet tone, owned to the anhydrous environment and to the fact that the desiccation takes place with the exposure to the sun. The thyme and the flower's honey produced in Santorini is of exceptional quality. A special product of the island is the fresh goat milk, which is dried naturally to the sun and has a characteristic piquant taste.